As companies keep their existing hardware and operating systems for more years than ever before, the need to diagnose and repair problems is becoming ever more important for IT Pros and system administrators. Whatever version of Windows you’re using (including Windows 10) you’ll likely need to maintain compatibility with older software that the company must use for mission-critical operations, or older hardware that’s required for specific purposes, but you don’t want to sacrifice security for the sake of compatibility. 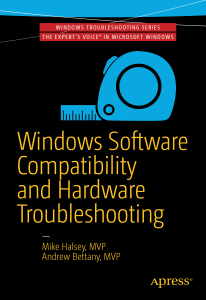 In this briefbook you’ll learn how to maintain optimal compatibility with the older software and devices that you need to use. The authors are well-versed in training in classrooms and video, with Andrew Bettany running the IT Academy at the University of York, and IT Masterclasses and Mike Halsey being a teacher, tech-book author, and having produced many tutorial videos under the brand PC Support.tv. IT Pros, Windows expert and power users and system administrators are the audience for this book. You can buy this book from Amazon and all good booksellers.